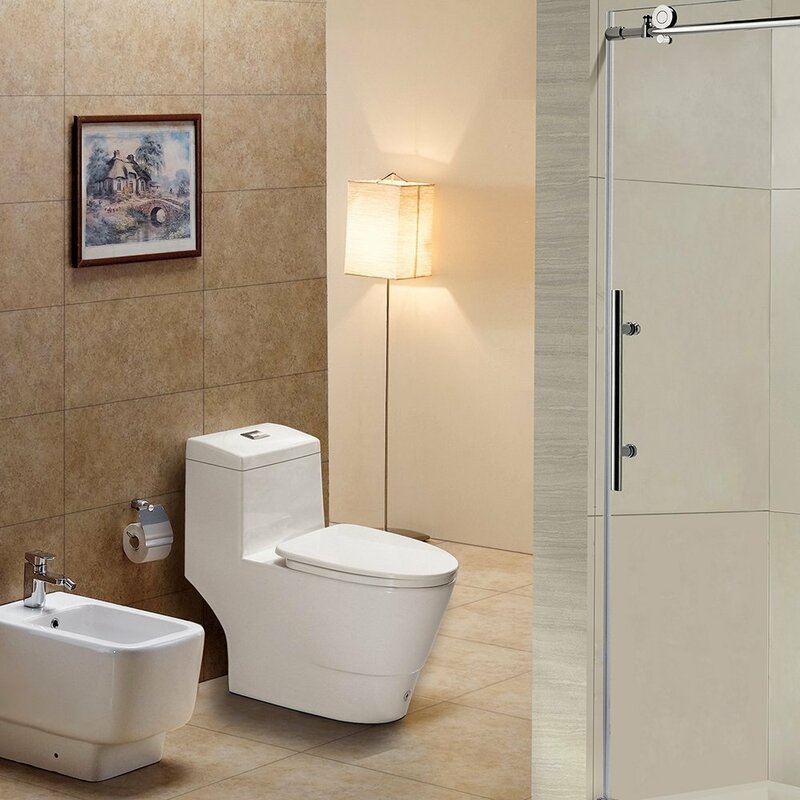 The Woodbridge T-0001 High Efficiency Elongated Toilet is a well designed and ecologically friendly toilet. For those who appreciate a modern finish to their bathroom, this powerful toilet will offer several toilet enhancing features that will be as good for your bathroom as they are for the environment. One of the first things to note is the soft close toilet seat. This ingenious feature will prevent your toilet seat from slamming down against the toilet rim and not only helps prevent the loud bangs associated with it, but also helps prevent the risk of cracks or damage happening to the bowl itself. The super glazed bowl allows for a quieter and more powerful flush which also helps prevent the buildup of limescale and everyday toilet dirt. 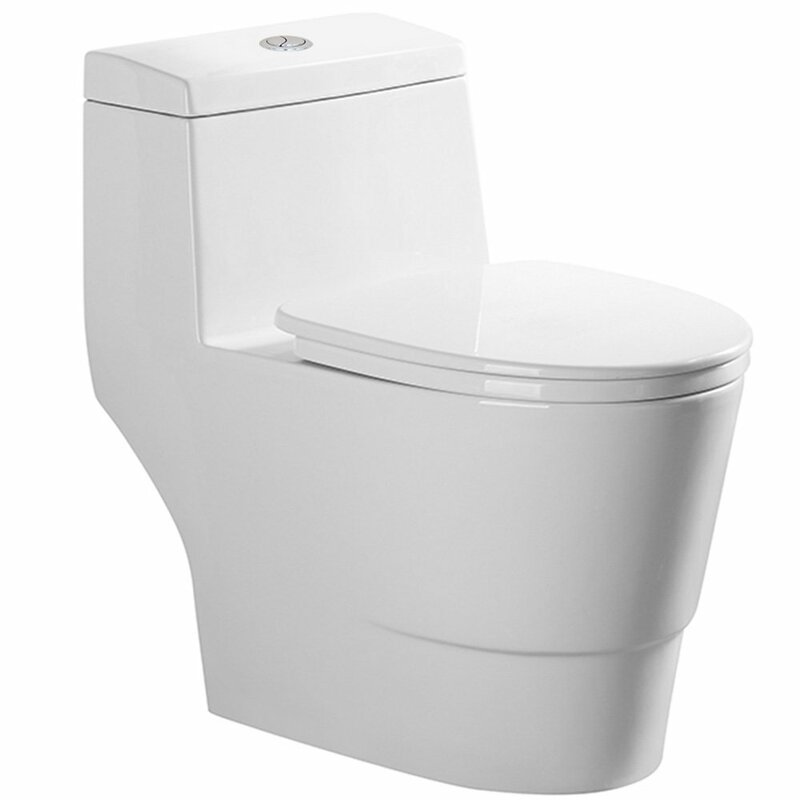 This powerful flush also helps reduce the amount of water required per flush and features a dual flush system. The dual flush system lets you select whether you want to opt for a 1.6 or 1.0 gallon per flush, therefore, you can use less water per flush as needed. Sloping cistern lid makes it impossible to stand anything on top of it. And provides ample height, which is especially useful for those who are less able bodied and find it difficult to stand from a low sitting position. The slender nature of its design also makes it a good choice for bathrooms that are lacking space. The installation of the WoodBridge toilet requires no specialist tools and is installed in the same way that most other toilet bowls are put in place. This makes installation a quick and easy one and one that can be performed by a skilled DIY fanatic or via a local plumber. This also reduces the cost of the unit as there is no need to purchase any special tools. Things To Consider Before Purchasing. The Woodbridge is a fantastic budget toilet that is low on price and high on style and design. Some of the features such as the dual flush and the quietness have been well thought out and nicely wrapped up into the design of the unit. Another nice feature is the soft-shut toilet seat and lid that helps prevent damage to the lid or bowl by preventing any slamming motions. This toilet is a little taller than most standard height toilet systems. While this may prove to be ideal for those who are taller than average or who suffer from conditions of leg and spine mobility, it will make it more difficult for children to use. The sleek design and slender dimensions of this toilet also make it a good choice for bathrooms that are low on space and in need of a fully functional toilet that can fit into narrow spaces. All in all, the Woodbridge is a great choice for the majority of bathrooms and offers style and substance with an economical price tag. When taking all of the above points into account, the Woodbridge Toilet is worth the price tag that it has. While it is possible to purchase a cheaper toilet, the unique quiet flush system, dual flush choice, and ease of cleaning make this an all-around winner. If you have the budget for this toilet, you will be guaranteed of a well-designed toilet system that will easily fit in with your existing bathroom design.